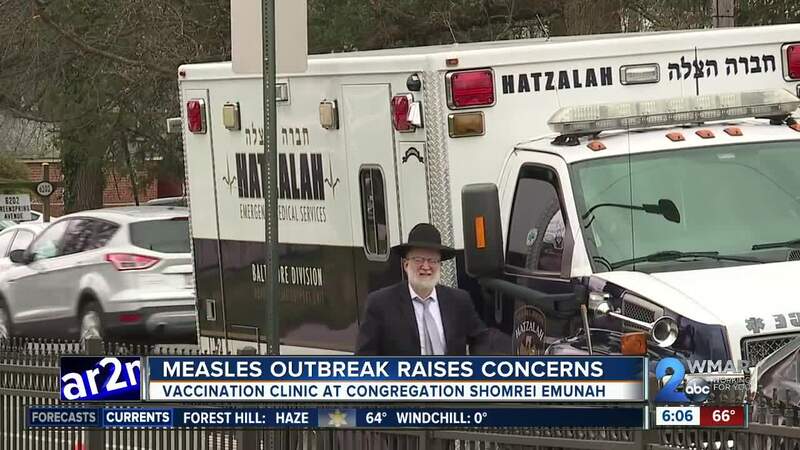 Dozens of people got their measles vaccine on Friday, this after one confirmed measles case in the area and before many people travel to high outbreak areas for Passover. BALTIMORE, Md. — There are more that 450 measles cases throughout the country. Only one confirmed case in the Baltimore area. "To be honest if it didn’t come now I had a feeling after Passover it was gonna be here because a lot of people travel and visit family and friends in New York or Detroit," said Rebecca Brockmeyer. That's why she decided to get a booster shot on Friday. She said, "people are coming back after Passover and might bring it with them. I just have peace of mind knowing I’ve gotten another shot so I have another layer of protection." Friday, the Baltimore City Health Department partnered with Sinai Hospital and the Orthodox community to have a free measles vaccination clinic . The clinic was specifically for people between 30 and 62 years old who either never got vaccinated or only got one vaccine in the past. "The best way folks can protect themselves is to get the vaccine. They should do it for themselves. They should do it for their family and they should do it for their community," said Jennifer Martin, the Deputy Commissioner for Population Health and Disease Prevention. It's a message the Jewish community took seriously. "There was outreach from schools and synagogues, and it seemed like an important thing to do," said Isaac Pretter. "We are traveling for Passover, and we’ll see people from other parts of the country, other parts of the world want to make sure we're properly vaccinated and do what we can to be safe." It's a tight knit community looking out for each other. "We're a community. We all live close to each other here. We’re constantly in contact, and I want to make sure I’m doing my part to help protect our community," said Brockmeyer. Health officials recommend everyone get their vaccines.